The advent of technology has made an impact on our lives by making things easier and a lot simpler. Technology has affected all aspects of our lives including the time we used to spend in the kitchen. One such appliance that uses new revolutionary technology to help save time and energy is the induction cooktops. Thinking “which is best induction cooktop?" Well, read on to get an answer! In this quick guide, we will go through how to choose the best induction cooktop. Besides that, we will also look at the advantages and disadvantages of induction cooking. So that by the time you are finished reading, you will be able to make an informed decision. Induction Cooktop – What is it? 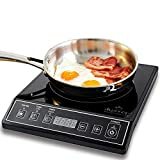 How to select the Best Induction Cooktop? Induction cooktops are similar to the ceramic type cooktops. They are made up of durable, heat-resistant ceramic or glass material. Induction cooktops are marked with distinct cooking zone where you place your pans or pots. A tightly wound metal coil is present inside the cooking zone. When the power is turned on, the coil gets filled with alternating electric current, which produces invisible magnetic field. However, there is no change in the surface temperature unless a pan is placed. Once the pan is placed, the magnetic field penetrated the iron and resulted in heat. The magnetic field results in eddy current to heat up the pan. There are numerous benefits of using high-quality induction cooktops, but the greatest advantage you can achieve is the quick turnover time. With an induction cooktop, the heat is directly transferred to the cookware which heats up the food and water in short period of time. With induction cooking, the heat is produced in the pan, and more amount of energy goes into the food. Induction cooking is around 25–50 percent faster than other methods. Induction cooktops are made up of ceramic and are incredibly easy to clean. It’s just a flat cooktop. Simply wash it with soap and wipe it clean with a cloth. There is no open flame on the cooktop, and the cooktop remains relatively cool thus eliminating the chances of getting yourself burnt. There are 3 types of induction cooking stoves, which are available in different size and quantity options. The built-in induction stovetops are flat sculptured ceramic glass units that can conveniently be installed in the kitchen countertop. These stoves are sleek looking and are available in a variety of colors. You can choose to install them at a location which is convenient to use as they are available in a variety of zone layouts. Another category of stovetops that are available is the freestanding induction. Companies offer full ranges in a modern stainless steel and various standard color design to match your kitchen. So if you are planning to get a whole new induction range, you can easily choose from a variety of zone options. They are also available in a mix of induction and electrical zones. The single unit induction cooktop is the most convenient and useful induction cooktop as it is available to buy off the shelf, portable and light. You have the choice to choose between a single or double burner. The biggest advantage of this type of induction cooktop is mobility and lightweight. How to Select the Best Induction Cooktops? Based on your cooking requirement and preferences, you can choose a cooktop that comes with one, two or up to five burners. Moreover, if you are looking for precise temperature settings, you can easily get your hands on built-in cooktop as it has variable power range and come even have additional features such a more robust safety features. Next important factor to keep in mind while considering an induction cooktop is the amount of countertop space you have. A build-in and freestanding induction cooktop will occupied fairly large space in your kitchen. If you like to cook faster, make sure you pick up the super burner that is built to deliver higher voltage. In case the induction cooktop overheats, or if the hot plate is left on, the auto switch-off feature will automatically cut off the power. Many induction cooktops come with this features, so make sure you look for it. Safety sensors in induction cooktop monitor the temperature at the bottom of the cookware. They adjust automatically with the power output to avoid damaging the cookware. Induction cookware is necessary for the induction to work. If the pan is not induction compatible, it will not work. Moreover, if the pot and pan is removed from the cooking zone, the cooking will stop, and a warning sign will be indicated. However, it comes with its share of downside, and one of the biggest drawbacks is that it creates a a buzzing like noise when operating. The sound is produced due to magnetic currents, and the frequency of sound can vary depending on models and the wattage. Induction cooking requires special induction cookwares that are compatible with the cooktop. These cookwares are made with magnetic materials such as cast iron or stainless steel. To ensure the compatibility of the cookware, you can perform a magnet test. If the magnet sticks to the bottom of cookware, it will work with your induction cooktop. While looking for the right induction cooktops, you should also take note of the following points. Inductions cooktops are just as powerful as an electric or a gas cooktop. Some of the best induction cooktops offer a power boost features, which makes cooking faster. A majority of induction cooktops can be easily placed right into the countertop. Apart from taking note of the product dimensions, you should also carefully take a look at the cutout dimensions. If you are installing an build-in or freestanding induction cooktop, you may need the help of an experienced electrician to make sure that the electrical circuit can easily handle the power of the cooktop. When it comes to induction cooktops, ventilation is still a necessary part. While very little hot air escapes the cookware, odor, grease, and smoke are still present. Thus the need for a ventilation system arises. The Secure 9100MC has 15 power levels from 200-1800Watts (140 Degree Fahrenheit to 460 Degree Fahrenheit) and ETL approved. This device also come with features such as count-down digital timer, auto-pan detection, error message system and voltage warning system. This induction countertop is compatible with cookware such as cast aluminum enameled iron and steel, stainless steel with a magnetic bottom, or cast iron. The major different between the 9100MC and 8100MC model is that 9100MC has 5 more power level, a slightly larger cooking space top and come in all-black stainless-steel frame design. Other than that, all features remain identical. As for design, 8100MC featured a flat cooktop design, and 9100MC has a beveled control panel area. This cooktop is available in two colors – black and gold. It is a lightweight, easy to transport compact cooktop which uses 120 volts and 15 amps of electricity. It is a budget friendly cooktop loaded with some amazing features. There’s a low and high voltage warning system along with a digital countdown timer. Auto-pan detection and build-in safety feature. If you are looking for a portable induction cooktop which is lightweight, then Max Burton 6200 Induction Cooktop should be your pick. It can easily work with less than perfect induction cookware. The temperature range is between 100F - 450F degrees which is suitable to cook just about anything. There you have it. We hope that this guide has helped to provide you with some good information on induction cooktop. 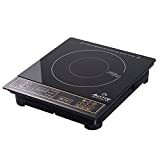 We also hope that the above portable induction cooktop reviews has helped to select the induction cooktop that suit you. If we were to take a side, we would pick the Secura 9100MC Induction Countertop as the best induction cooktops. 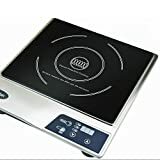 Not only does this induction cooktop come with all the excellent features but it also scores a high rating as well as good net customer satisfaction grade. Also, Secura is also a well-known brand for induction cooktop and is also one of the best induction cooker brand around in the market.